How does the E-teen leader program work? The E-teen leader program allows teenagers who are targets of bullying and cyberbullying the ability to reach out to teen leaders online in private chat rooms, discussion boards and e-mail. The program provides a safe space for teens to communicate what it’s like for them to go to school and be teased, physically intimidated, beaten up, socially excluded from their circle of friends or tormented online, through social networks, texts or the internet. 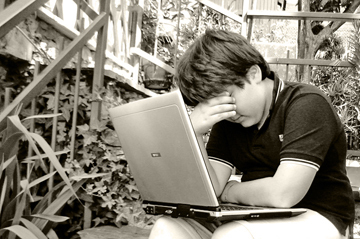 Many E-teen leaders have overcome cyberbullying and bullying and are now able to turn on their computers and go to school again. Online E-teen leaders volunteer their time because they are supportive, caring, non-judgmental and open-minded. E-teen leaders specifically train to deal with difficult situations. They will not judge you. What you will get is someone who will read your emails, understand your concerns, and help you know what options are available. E-teen leaders and targets of bullying have been recruited from high schools spread across the country. After being accepted into the online program and completing a training course, E-teen leaders are required to volunteer for a minimum of at least one year. During this time, they will work one shift for three hours per week after school online on their personal computers. Arrangements will be made for students who do not have a personal computer. The program helps students build character and integrity, which sets the stage for them to learn how to manage their feelings and have empathy and compassion for bullies, instead of becoming one.